Gee, I’ve been writing about huge things in the most recent posts. Egypt’s pyramids, the imaginations of ancient Indian seers who composed the Rg Veda. I need a break from those alpha-males. The Great Wall of China, the Pyramids of Giza–many people measure a civilization by the big things it builds. But other cultures have excelled at objects from everyday life. These societies have been as creative as the ones that have made huge monuments. Thailand is one of the best examples. Thais have created an enormous range of popular art forms that have graced ordinary life. Let’s take a look at one. 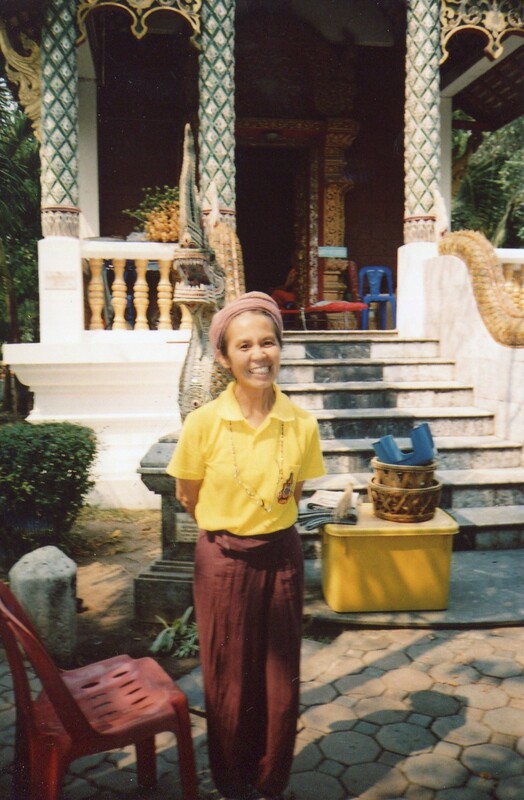 Many Thais have traditionally believed that every piece of land has a spirit. When people build a home, they must offer food to the spirit that resides on their property. 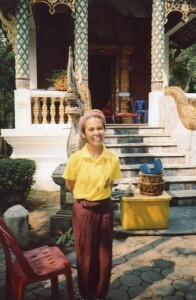 Belief in spirits is very common throughout Southeast Asia. People who disrespect them can suffer misfortunes. But Thais have turned this belief into an art form that’s both beautiful and fun. 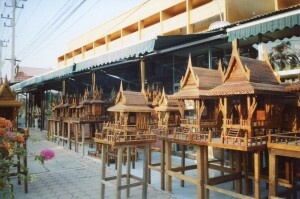 The spirit house is one of Thailand’s most popular folk arts. People erect little shrines and place offerings in them to please the land’s spirit. They’re in the form of traditional homes raised on stilts. Most thus sport the flowing lines and pointy gables of real homes. How could a spirit not be happy to live in such a pretty place? Members of the household (often women) deliver succulent food and bright flowers in the morning with pristine politeness. Hmm, maybe I’ll start praying for such a place in the afterlife. In Thai fashion, fears of animated powers in nature have turned into works of art that beautify everyday life. When I was in Ayutthaya, my tuk tuk driver and his wife stopped to buy food next to the store pictured above. The tradition still thrives. What a beautiful collection of Spirit Houses!